While Talal Derki was working on his first documentary feature—the Sundance-winning Return to Homs, a story that goes behind the barricades in the war-torn city of Homs, Syria, to follow 19-year-old Basset and his comrades in their quest for a successful revolution against the Assad regime—the seeds of his second documentary were sown. In Homs, he met a man who, he would later learn, was teaching his five-year-old son how to use weapons. The image lodged into Derki’s mind, but it wasn’t something he was able to use in Return to Homs, because his story focused on a more historical narrative. The image stayed with him and not long after he completed his first feature, he began to plan his next film: a story that would show the entire process of how an innocent child can be turned to be a fighter or a Jihadist. Over the next two years, he embedded himself into the small community of radical Islamists in rural Syria. He followed the daily lives of the Osama family (the father and his sons, since it was against the rules to put any women or girls on camera) to investigate what it is like to grow up in an Islamic Caliphate. And now, banned from his home country for making movies like this, and living in exile in Berlin, Derki brings this mostly secret way of living and rearing the next generaiton to the screen with Of Fathers and Sons. Here, he talks to Documentary about the struggles of getting the film made, why he feels it’s important to put fear aside and tell the truth, and what it means to be the only non-American documentary nominated for an Oscar this year. Documentary: What were some of the logistics to get in contact with the family and convince them to let you film them? 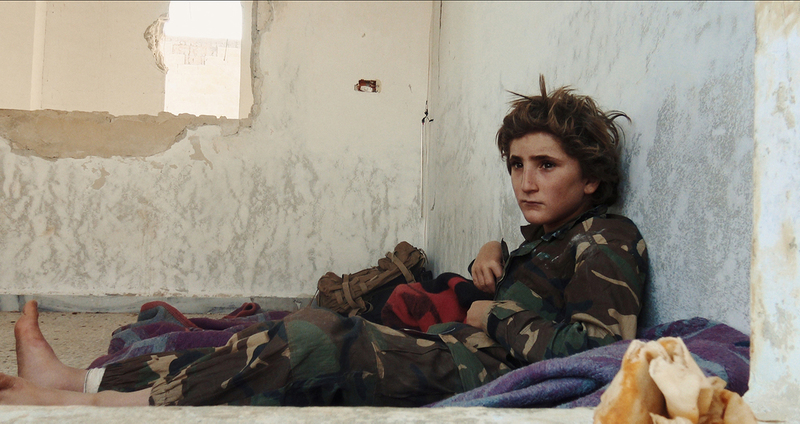 Talal Derki: After Sundance 2014, I returned to Syria to begin research. I went back and forth with my contacts on the ground who had access to this man and his family, and finally, we found them. I had begun to shoot some additional footage, and a character I was filming turned on me. He didn’t want to continue the shooting and was mad when he learned that I was a moderate Muslim, which is what I’d presented myself as. He said there is no moderate Muslim, there’s only Salafist Muslim as Muhammad. Period. So he didn’t accept me and I understood then that if I was to present myself as anything less, then they would not allow me to film what I wanted and would only allow me to film things that supported their propaganda and their ideology. I realized that the safest way to protect myself, and to be able to film freely, was to tell them that I was a sympathizer. Someone from my previous film had become a leader in the Al-Qaeda front, and I used his communication to get through this society. He was an old friend of Osama, and he introduced me to him and his family. We shook hands and then he left me and my cameraman with them, and we used this footage in the film. D: Were you scared at any point? TD: You cannot live if you’re scared. If I were scared, then I wouldn’t be able to explore this topic. I always say that this is a long war between people who are open-minded and dream of the nation coming together, and people who are extreme conservatives who need to control religion, the military, the economy. This is my home country, which makes it that much worse to see it happen. So, I feel that I need to show the people and make a film that doesn’t necessarily criticize, but shows more understanding about what is happening there so that we can find a solution to move forward in peace. Being scared does not help at all. D: I guess you could argue that the extremists aren’t scared either. TD: They aren’t scared because their relationship with death is [quite different than ours]. Death for them is a request; their whole life is just a bridge to the paradise that they believe in, which they get to with all their killing. D: This is only the second feature doc that you’ve directed. You’re clearly hitting a nerve with audiences. Why do you think that is? TD: I’m working in a style that I think is quite shocking to the audience. A shocking reality. We are so close to the people in this extremist word and it’s a tragic situation of the masculine power and ideology that shows how war affects us. It’s a nightmare. I was honest with the audience; I told them from the beginning that I was going to capture my nightmare, so this is what this film is about. I worked hard, though, to not show the direct violence in order to bring people in to understand more about the whole process and how this ideology is created. D: The picture on your Twitter home page is of you and the children from the film. Did you become quite close with them? TD: I spent most of the time with the kids, though it took a few months for them to get comfortable with me. But I'm also a father, so I could speak the same language and I knew a lot about their backgrounds, even if their memory was only connected to a war. I worked hard to get through to them so they could feel open to us. And I wasn’t their parent, so maybe they felt freer to speak and to behave however they wanted to in front of me. I didn’t judge them, I didn’t speak meanly to them; I was always the good guy, bringing gifts. They loved the camera and they loved to share their stories. D: Did they ask you any questions or was it mostly you asking them questions? TD: They asked what Berlin looked like. They wondered if it looked like their village; this is a question from children who think that the whole world is exactly like their world. D: You were lying to them about your affiliation. Was there any reticence about lying to the children as opposed to lying to the adults? TD: The lying was more to convince the adults and the foreign terrorists who never felt comfortable with a camera on them. So, I was always convincing the adults about who I was and what the film was about, telling them that it was about the power of Jihad and the great education they give to the children. D: Was there a desire to “rescue” these children at all? Did you want to take them away from all of this? TD: I always felt this. The most risk for these kids happened because of their father—he had all of his explosive devices in their home where the kids are sleeping. He brings them to work and then sends them to the camps to learn to fight. I would tell myself that these children are innocent, please take them out of this, they can have a better life. They are victims like us, like the women. But there, in that world, they just do what their father tells them to do. D: How does it feel being nominated for an Oscar? TD: I can’t describe my emotions; I'm still trying to take it all in. I can’t believe that so many people share all this love with us, how happy they are for us. The fact that this is the only documentary that takes place out of the United States and that people were voting for it is just such a huge success. Everything I’ve lost, I’ve been able to do this instead and it’s just the biggest happiness that’s ever happened to me, and the biggest moment in my career as a filmmaker. Of Fathers and Sons will screen as part of IDA’s DocuDay, a daylong showcase of the Academy Award-nominated documentaries, taking place at the Writers Guild of America theater in Beverly Hills.